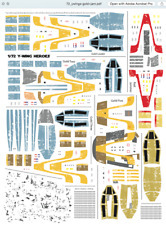 Laser printedDecals for Bandai's 1/72 kits, designed by Cosmos Models. Bandai Limited HG 1/144 Gundam TR-6 Hazel II. Paragon Designs. 1:1 Scale Weapon Models. Hobby Boss. Copper State Models. Alliance Model Works. Super Scale Int. Reality In Scale. Tiger Model Designs. A pre-owned Master Scale (1/100) Strike Gundam that was flown by Lukas O'Donnell. This gundam is a bit of a fixer upper because a piece of the ISWP (the smaller wing) and his left foot require regluing. Condition is Used. what u see is what u will get in the pictures. Gundam 1/144 HGAC HGUC #211 Gundam Wing Leo Model Kit built. Condition is Used. Shipped with USPS Priority Mail. 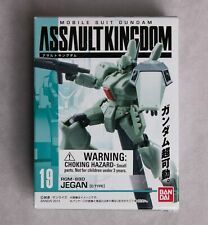 A landmark in Bandai's MG kit history that's not to be missed! 2.0 MG 1/100 Model Kit. Manufacturer # BAN155520. The Guntank from "Gundam The Origin" is more squat and vehicle-like than we're used to seeing. Includes details such as radiator fins and a tank hatch that can be built in an open position. Molded in gray, dark gray, and khaki, with dry-transfer decals for markings. Kit# 5057731. Marking stickers are included to recreate the settings. Estate find. What you see is what you get. Box is open and has minor wear from age and storage. Toy is sealed in the original plastic. Sold as is and as found as pictured. The original Gundam, revived 35 years later! UPC 4543112967169. Manufacturer # BAN196716. From the Gundam Series by Bandai. keep away from children 3 years of age and younger. Suitable for Ages 15 & Older. Pictorical instructions written in Japanese. Hobby knife (RMXR6909). Bandai HG Build Divers Impulse Gundam Lancier Karuna's Mobile Suit 1/144 Model . Condition is New. Bandai HGUC GUNDAM RX-93-V2 Hi-V (Hi-Nu)1/144 scale kit built and painted. Modified and has Six Working Funnels. Action base not included. Condition is Used. Shipped with USPS Priority Mail. Bandai Iron-Blooded Orphans IBO Gundam Barbatos Lupus Rex HG 1/144 Model Kit. The tail blade is attached with posable lead wire, too! Product Details. Manufacturer # BAS5055451. Other weaponry includes two GN Beam Sabers, a GN Beam Rifle, and a GN Shield. A sheet of foil stickers is provided for detail. Manufacturer # BAN156836. GUNDAM Mk- TITANS #23. Assault Kingdom. make Supersized seem small. Get images that. Previously owned condition. PICTURES SHOW THE ITEM YOU WILL RECEIVE. Sealed - New. 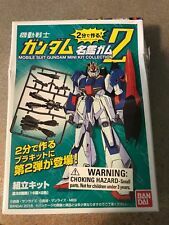 Bandai Gunpla Starter Set Vol. 2 with Marker Gundam RX-78-2 built. Condition is Used. A few weapons to build but this comes as is. Shipped with USPS Priority Mail. A plastic injection model kit of the popular super robot Mazinger Z. Features rubber torso and hands to replicate curved and angled body parts. Includes rocket punch spring loaded firing gimmick in one arm. 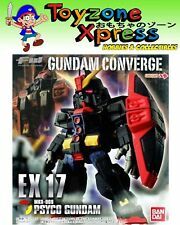 A new Gundam model line created to celebrate the 30th anniversary of GunPla (Gundam Plastic Model) with the grand daddy of all Gundams, the RX-78-2. Height 12.400. Bandai Hobby Full Armor Gundam Thunderbolt Ver. Re-release of the Thunderbolt Full Armor Gundam kit. Manufacturer # BAN207885. Alliance Model Works. Copper State Models. Hobby Zone. Custom Dioramics. Microscale Decals. Failure to comply with this will result in unpaid item filing. Yahu Model. WingNut Wings. Did you join the Jaeger Uprising?. As a bonus, 2 different versions of Scrapper are included to replicate scenes in the finale. Weaposns from the original releae including Gravity Sling, Plasma Caster and Chain Sword are also included. Land spinners move and the wheels spin. Includes a wide variety of accessories, such as a maser vibration sword, slash hariken which can be fired with guided wires. Cockpit recreated in details. Bandai Hobby Lelouch the Rebellion Code Geass Lancelot #1 1/35 Scale Model Kit. UPC 4573102555267. Manufacturer # BANS55526. IV 1/60 Scale Model Kit. IV joins the High Grade model kit lineup from Bandai! Manufacturer # BAS5055351. BANDAI Gundam Base Limited Barbatos (Iron-Blooded Coating Ver. ).